ISLAMABAD, March 17: The Patron-in-Chief of the Supreme Shia Ulema Board and chief of the Tehreek Nafaz Fiqh-e-Jafariya Agha Syed Hamid Ali Shah Moosavi has said that there is a Godly help that the citizenship of Australian terrorist responsible for Christchurch (New Zealand) Masajid attacks has come to the fore otherwise this blame would almost certainly have been leveled against Pakistan or Muslims. Every human-loving person shares the grief of the bereaved families of those who have become target of New Zealand terrorism incident and also condemns it strongly. Some Hippocratic faces have been unveiled, therefore, the international community that is in search of peace should change its attitude and the countries who created terrorist nurseries for the opponents of Syria, Libya, Iraq and Yemen and were also responsible for the Soviet destruction and bring them to justice otherwise the merciless acts of terrorism would shatter peace of every peaceful country. These views were expressed by him at the event of Youm-e-Wiladat Purnoor of minor hero of Karbala Shahzada Ali Asghar (A.S.). Agha Moosavi said those countries that are advising Pakistan to give up tension and exercise restraint should stop India from war-mongering and keep the trap of exercising the role of mediation to themselves and tell what is the role of the United Nations to play in such situations. He said the mediation is always carried out on the basis of ‘give and take’ while Kashmir issue does not fall in that category as it is not trade but the issue of life and death for billions of human beings. He said Pakistan is in a state of war so when the 39-state Islamic Armed Alliance would jump in to help Pakistan? Otherwise, he added, it would be gathered that this alliance has been created not for the protection of Harmain Sharifain or Muslim States but only and only to provide protection to the royal family. He said Karbala is the eternal war against oppression and Hypocrisy. 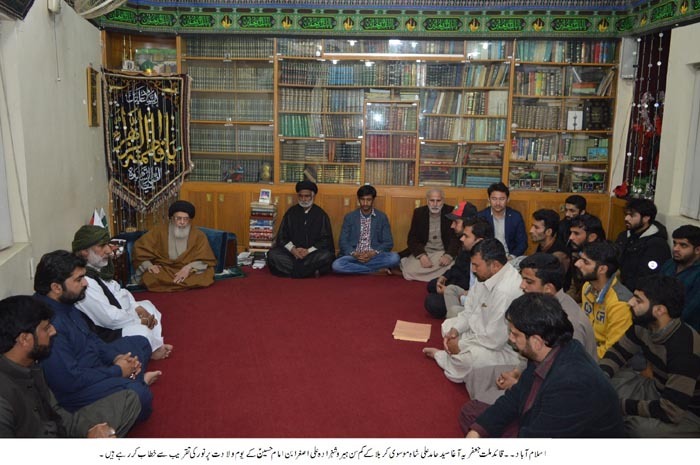 He called for raising voice of protest against colonial terrorism in the events of Youm-e-Wiladat of Imam Muhammad Taqi (A.S.) on Rajab 10 and in the concluding programmes of Ashra Ajr-e-Risalat and prayers should be offered to the unity and oneness of the Islamic World in these gatherings. He said the oppressed world can be got rid of all problems and difficulties by following the seerat of Muhammad (SAAW) and Aal-e-Muhammad (A.S.). The TNFJ chief said that chief of the colonial powers and her subordinate countries i.e. India and Israel are the creators of terrorism. After the Russian breakage, America transformed the warriors prepared by them into terrorist organisations to target Muslim States and Muslims in the light of international agenda by staging the 9/11 drama. After that, he added, they raised the slogan of crusade turned dozens of Muslim States including Afghanistan, Iraq, Libya, Syria and Yemen into debris. He said by keeping Pakistan on the front line it has also been kept on the hit-list of terrorists and turned Afghanistan into Tora Bora using the Pakistani soil. He said the creators of terrorism were joyed when Trump came into power. The patrons of terrorists, he added, divided Muslims help creating 39-state alliance and then Iran was termed as the centre of terrorism because it was assisting the freedom movement of Palestinians. He said differences have been created among the Gulf States by initiating boycott of Qatar and continuous flared differences among Muslims so as to sell their arms. He said Trump imposed ban on entry from about half a dozen Muslim States and declared them Islamic terrorists linking terrorism with Muslims. Agha Moosavi said that America opened the mouth of its armament factories for Indian Prime Minister Modi who has carried out massacre of Muslims in Gujerat and also blamed Pakistan for different incidents they jointly sponsored in India on the pattern of 9/11. He said Pulwama is also a part of that series in the garb of which Modi has brought the South Asia on the brink of war. These steps of Modi, he added, are a part of his plan to seek votes in oncoming elections by spreading war hysteria among Indian people. He said India also sponsored Pulwama-type incident in Zahedan so as to create gulf between Iran and Pakistan following the Chankiayee politics and she succeeded in her attempt to some extent. He said America always termed all incidents of terrorism taken place in western and non-Muslim countries as activities of Muslims and when any non-Muslim is found involved in such incidents he is declared mindless. He said such an attitude was actually an open act of terrorism. He said our point of view announced about 30 years ago has been proved true that “a terrorist has no country, Maslak, religion; he is only a terrorist and should not be linked to any Maslak, religion or State”. Today, everyone is supporting the same point of view, he concluded. The Quaid-i-Millat Jafariya Agha Syed Hamid Ali Shah Moosavi said that we would have to differentiate between extremism and freedom movements and get the Kashmir and Palestine issues resolved in line with the United Nations Resolutions and in accordance with the desire of the respective people so as to root out terrorism. He said those who hope to stage dramas like 9/11, Pulwama attack and other such incidents and put the blame on Pakistan should keep in mind that the whole Pakistani nation is ever ready to face all types of situation the proof of which has been given by Pakistan’s Armed Forces by downing the Indian fighter planes and Drones.